touchPlan also enables inflight access to a worldwide database of airports and naviads, included details such as runway length, frequencies and elevation. touchPlan allows pilots to quickly determine time enroute, based on winds aloft forecasts. Designed to work even when no Internet access is available (i.e. in-flight), touchPlanHD facilitates the creation of flight plan routes via its internal worldwide database and can use either realtime or cached winds aloft forecasts. touchPlanHD allows routes to be created via any combination of airports, navaids or navigational intersections. touchPlanHD has an integrated mapping function that enables flight plan routes to be overlayed on either a political map or satellite image. 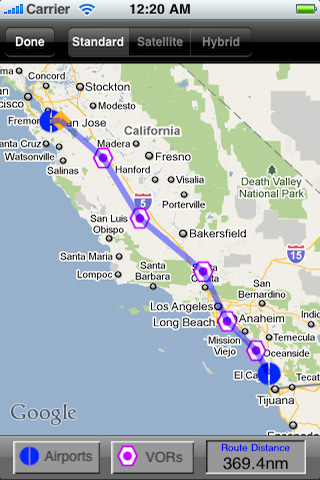 Routes can be created via a touch-based graphical interface, directly overlayed on these maps. touchPlanHD utilizes NOAA winds aloft data (for the US) and automatically calculates ground speed as well time enroute based on these winds. User-defined aircraft profiles enable touchPlanHD to calculate Top-Of-Climb and Top-of-Descent points, as well as factor varying wind gradients during climb and descent into ground speed, heading and time enroute calculations. User-defined waypoints can be created and used in flight plan routes. touchPlanHD’s internal database of airports and navaids, as well as its winds aloft caching capabilities allow access to flight planning functions even when no Internet connection is available (with the exception of certain web-based maps). touchPlan HD supports iPhone, iPod Touch and iPad devices.